Although Lawrence Welk has shown up here on the ol’ GMC more than once, his appearances have mostly been in a supporting role, as in When Lawrence Welk Became Cool, a piece about jazz saxophonist Johnny Hodges. I’ve always maintained that during my teen years I pretty much considered Welk and his music hopelessly square, and wouldn’t be caught dead watching his TV show — at least until I began to notice the Lennon Sisters. Although the Lennons had been performing on Welk’s TV show since 1955, I don’t think I paid much attention until and I got a little older and — like most teenage boys — my head began to be turned by pretty girls. The Lennon Sisters certainly qualified (especially one who was just about my age) and I soon found myself a lot more interested in watching Welk’s TV show. In subsequent years, the sisters performed regularly on other TV programs and even had their own variety show for a while. In the decades since, they’ve continued to perform fairly regularly while juggling marriages and children, often showing up in Vegas and Branson. 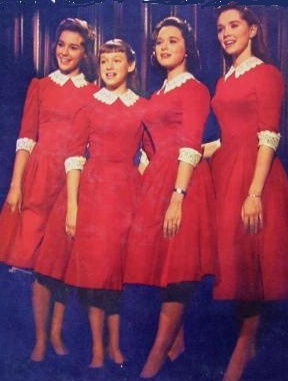 At times, one or the other of the originals will stay home for a while, either replaced by youngest sister Mimi or turning the quartet into a trio, but their long-time fans can even now find the Lennon Sisters still around. Glad you liked it, Russ. I didn’t include it in the article, but the girls had their share of trauma during their career — according to wikipedia their father was murdered by a crazy stalker who thought he was married to Peggy. Back in 1955, 10 years old, I started playing the accordion. My main reason for watching the show. I always wanted to play 1/2 as well as Miran, but fell in love with Janet of course. Met her back in 1966, through a Navy shipmates that had attended school with the girls. I had no idea at all who she was. Wasn’t till we got back to the Oriskany that Ray told me who she was. God Bless the Lennon family and thank you for your years of entertainment.